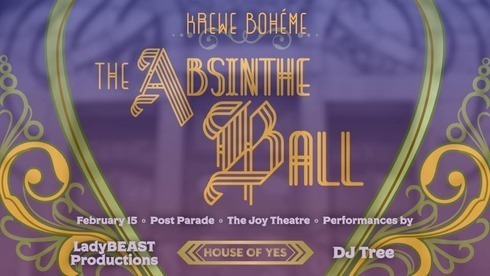 Krewe Boheme would like to invite you to our Inaugural Post Parade Absinthe Ball at The Joy Theater, February 15, 2019, doors open at 10 pm after the parade. House of Yes has teamed up with Ladybeast Production to present a night of unforgettable performances, costumes & fairy wings! Come dance the night away while the DJ Tree spins your favorite tunes. Limited VIP Ticket available. VIP includes an exclusive area with seating, swag bag, private bar/bathroom, and small bites. Don’t miss our very 1st parade with Supreme Fairy Vinsantos.